Humans have evolved technologies to compete for natural stones. The success was only to some extent, and it was up to overcome some deficiencies of natural stones. The charm, glory, and strength of natural stone paving remain unbeatable unless you make serious mistakes in the selection of material, Mason, and location for the applications! Let’s help you in making the right choices by giving a sheer comparison between artificial material and natural material for your interior paving. Before going to deeper into the comparison between natural stones and manufactured materials for internal flooring, I would like to give a brief list of both kinds of material used the most in the USA and elsewhere. The general comparison between both types of material gives us a rough idea that where we have to go. It is a bit expensive option and cost depends on the material you select. E.g., high-quality marble is the costliest option among all stones. Installation is comparatively simple and cheaper when you have skilled masons. I am sturdy and can use anywhere even in high traffic areas of commercial buildings. It demands to polish at regular interval and depends on the intensities of usage. You can restore it by grinding and polishing, as well as by filling up grout again if needed. Its coefficient of friction is high so mostly non-slippery and ideal for wet places like the bathroom, toilets, kitchen, and open terrace/galleries. Installation demands skilled masons and somewhat complicated as well as expensive. It is a bit fragile and gets cracks easily when used in high traffic areas or where load bearing is in question. It hardly needs any maintenance at all. It cannot be restored upon any severe damage, and you have to replace it. It has hard surfaces with almost nil porosity, so impervious to stains. Some tiles are semi-vitreous and vitreous with standard absorption rate. Impervious tiles are resistance to absorption and good for high traffic & wet areas. Its coefficient of friction is low so slippery depending on how surfaces have made and treated. I hope the listed comparison of advantages and disadvantages of both kinds of internal flooring materials have enabled you to choose a material type. Now, let’s dig deeper in both kinds of options for the internal paving. Different types of natural stones applied for internal flooring in different regions of the world depending upon the availability in nearby quarries. Following are options to make your selection. It is the most expensive option among the natural stone pavers, so the least used in home paving. Granite is an impervious stone material with the least porosity, so it is the least susceptible to stains. Being it the most sturdy & non-porous material, its applications in commercial interiors is more, but less in homes. However, it used as kitchen countertops and backsplashes more often than paving. Its maintenance is low, and design varieties are high as well as with good shining. It comes as sleek, high gloss formats, mattes, muted, and rustic textures. The most used and comparatively affordable material for internal paving across the world. Therefore, its availability is universal in a wide variety. It has a medium level of strength and porosity, which makes it applicable in almost all areas of homes and commercial interior paving. However, architects avoid its applications in high footfall areas as well as kitchen like spaces where the possibility for staining is high. It provides enough variations in color, design, shapes, and sizes. So, you can select the best shades and grain patterns based on the availability in your vicinity. Standard sizes used in present days are 1’X1’ and 1’X1 ½’ in industry. Marble tiles available in different thickness ranging from ¼” to ¾” in various applications. Grading of marbles is based on the quality of the material. For example, high quality with uniform material has given ‘A’ grade. Irregular surfaces, grain patterns, and minor defects downgrade it further from ‘B’ to ‘D’ grades. It shone amazingly when polished and treated well. Thus, it creates a natural affinity in the minds of onlookers at first glance. You have the option to give it the gloss or matte finishing. It can give timeless and elegant look-n-feel of your paving and stuns the visitors with its versatility and uniqueness in each piece. It has tonnes of varieties to choose depending on the availability in your region. Being the ancient stone material applied in interior decoration for paving, it becomes a choice of many. If you select rustic or traditional styles, it is an ideal choice for the kitchen. It is medium in porosity, so also used in bedrooms and common halls in the interior spaces. It is temperature resistant, and durable material for internal flooring. It is durable from peeling, cracking, and chipping. It extracted quarried from North America and the Middle East the most. If you prefer rustic look for your kitchen, Slate Stone is an ideal choice because it is resistant to heat and cold transmission and provides great buffers against weather extremities. It is inherent durable material for interior flooring but a bit pricey option. It has a bit high porosity so comes with high absorption rate and friction coefficient. Thus, bathrooms, toilets, and kitchens are ideal space to install the slate stones for your internal paving. It is available in solid colors as well as in multicolored varieties and different hues to create design splashes. Every single tile comes with natural artistry and unique in look. It is an excellent choice for dry surfaces like halls, living room, and bedroom. 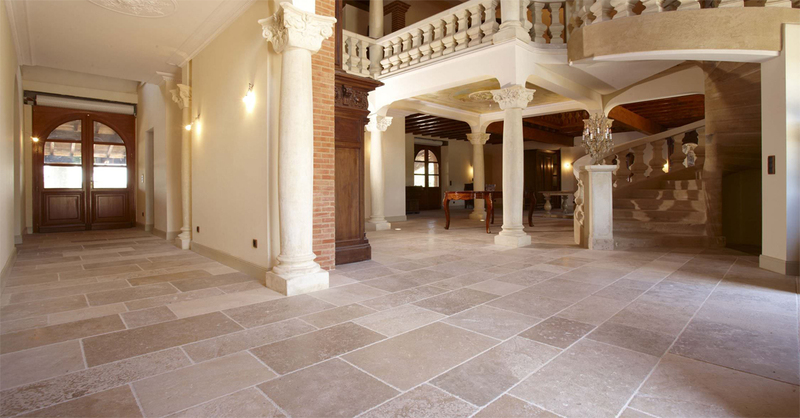 Polished travertine is high in resisting stains, slippery, and reflecting light with glossy finishing. Tumbled finishing by gently rounded off the corners and edges. It keeps antique look intact and has traction to provide a bit less slippery surfaces. Honed travertine is a sweet spot in between polished and tumbled travertine. So, it used the most in interior flooring. It is moderately durable and heat/cold resistance. By firing clays at high temperature, we can produce tiles as an artificial paving material. A range of tiles types prevailing in the market, but we will discuss, in the current post, only two highly used types of tiles in the USA. The manufacturing process of ceramic tiles consists of steps where molded clay heated to high temperature inside a kiln. Due to heat, structure get hardens, and color fuses in the design. The strength of ceramic tiles is low and porous. Therefore, it glazed further to make water resistance and shiny. It gives ceramic tiles durability and weather resistance. During the manufacturing process, we can add any color or combinations of colors to create desired motifs, patterns, and simulated materials. Therefore, you can get ceramic tiles in a square, rectangle, and triangle cuts. If you opt for a gleaming opulence and certain traction on the surfaces of your floors in various spaces, porcelain tiles paving is an ideal choice. Technically, porcelain is a kind of ceramic material. Fine grains of clay with the least contamination used in the manufacturing process and heat given in high temperature. It hardened the ceramic material more and glazed it to become non-porous. Therefore, porcelain is water resistant, moisture resistance, frost resistance, chemical resistance, and stain resistant! It provides enough design flexibility. It is durable and sturdy in compared to ceramic tiles. It requires low maintenance, fireproof, and repairable. Thus, it has a bit of heavyweight tiles and high price, but extremely durable and universal applicable material. Where to Find the Best Paving Material for Your interiors? After such insights, now you might have a question that, where to obtain a high-quality material with cost-effective rates and plenty of choices in the USA? I would like to recommend you to visit World of Stones, Hunt Valley, Maryland, USA. For the selection of natural stones. They used to offer Exotic Collection & Premia Collection for a wide range of options. For porcelain products, you will find a number of options to explore.